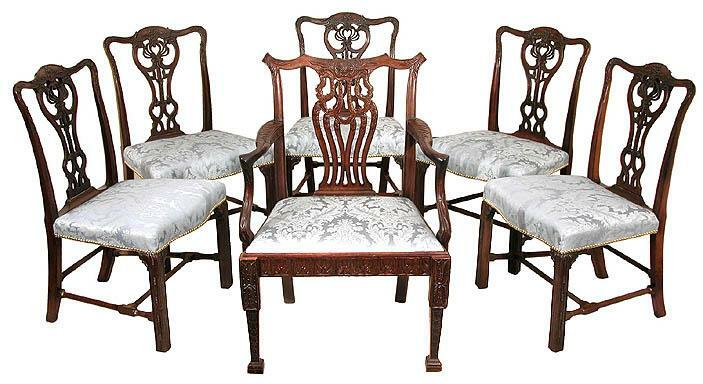 These chairs are some of the finest Chippendale side chairs available. Composed of heavy dark mahogany, with an old surface, the carving throughout is of the highest order. See details below.. 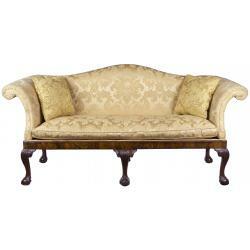 The seats are commodious, and bowed in the front, all of which are supported on strongly executed legs with an intricate reeding design complemented by magnificent corner blocks (see detail) and all tied together with beautifully designed shaped stretchers. These chairs are masterpieces. As far as condition, there are no breaks or restorations whatsoever. 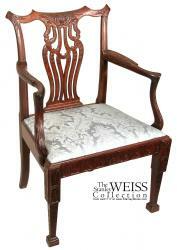 These are the best, and we have a related armchair in the same category and fabric to complete a set of six. Height: 37 in. Seat Height: 18 1/2 in. Width: 22 1/2 in. Depth: 19 in.